This Whole 30 Mashed Potatoes Recipe with Spinach will change your mashed potato life forever! 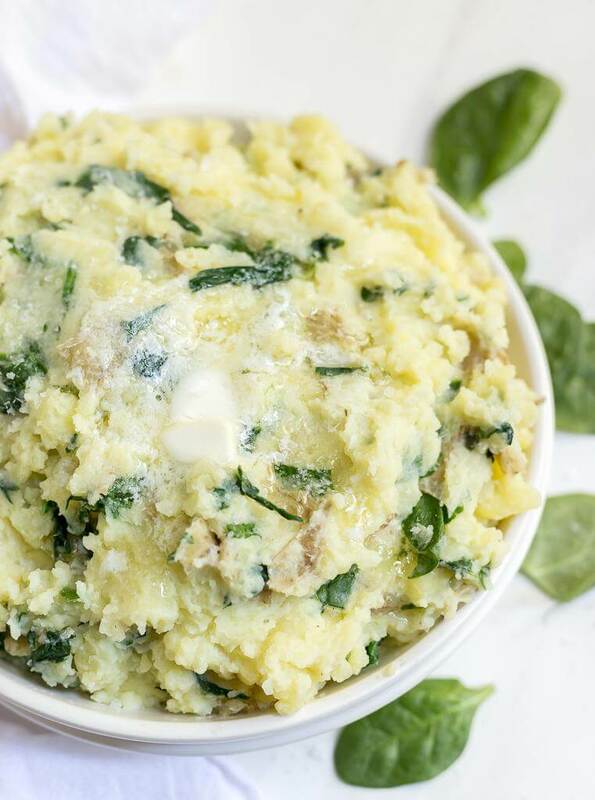 These dairy free mashed potatoes are light, creamy and flavorful thanks to fresh spinach. 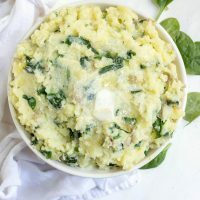 The spinach adds a little something extra and makes these mashed potatoes the ultimate holiday side dish! 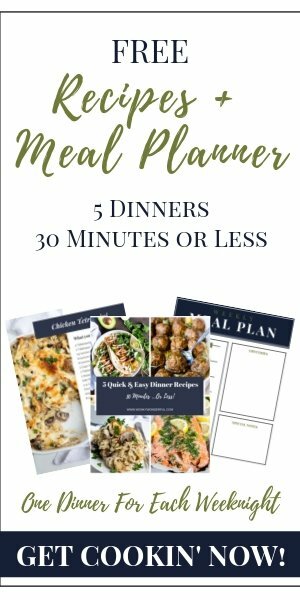 This recipe is Whole 30 friendly, dairy free and gluten free with vegan options. There is a much better substitute, in my humble opinion. 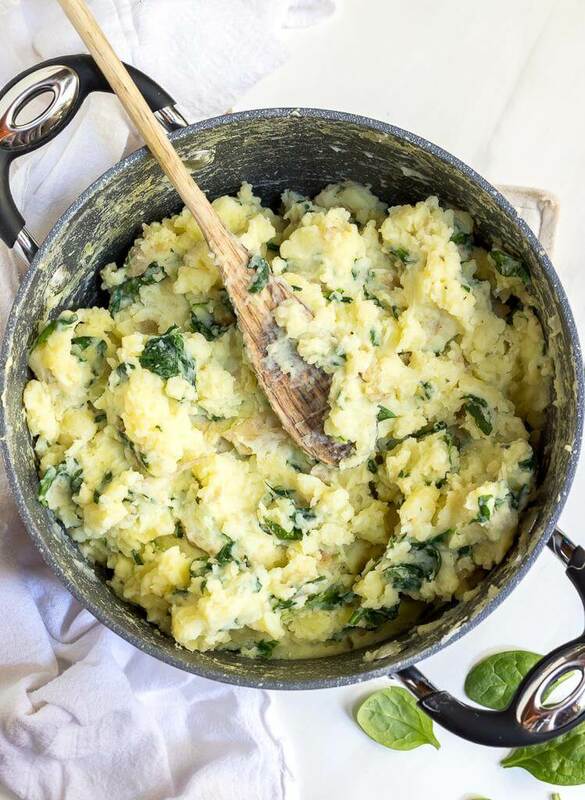 My dairy free mashed potato recipes use chicken broth. Not only does it give the potatoes a light fluffy texture, but, it adds loads of flavor too! For a vegan option you can use vegetable broth. Just be aware that many veg broths are slightly orange or red depending on the veggies they are made with. The color of the broth will affect the color of the potatoes. What can I put in my mashed potatoes? Obviously, spinach is at the top of my list here. Just trust me. My family/taste-testers were skeptical but even my harshest critic (The Mom) gave spinach a green light. In fact, she said we should put spinach in out mashed potatoes from now on. Let me just tell you that this woman takes her mashed potatoes very seriously. I’ve been adding spinach to a ton of recipes ever since my Earthbound Farm Organic Experience. You can read all about it and check out this recipe for Spinach Artichoke Smothered Chicken. If you want to add more flavor feel free to mix in your favorite potato seasonings, garlic, fresh herbs or any other veggie you happen upon. 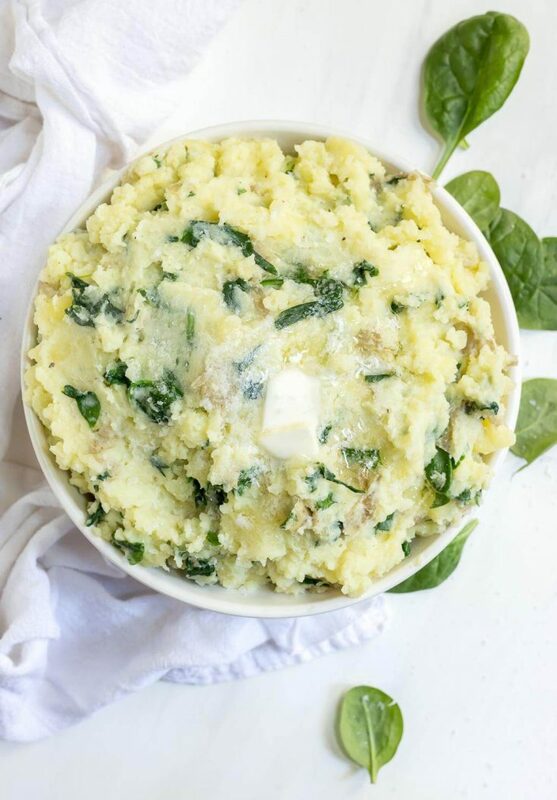 This Whole 30 Mashed Potato Recipe can be made even creamier if you mix in ghee before serving. You will need a Large Pot and a Potato Masher. Transfer washed and cut potatoes to large pot. Cover potatoes with water and bring to a boil. Boil until fork tender then drain. Add spinach to pot then top with hot potatoes after draining. Mash to desired consistency. Spinach should wilt while mixing with hot potatoes. Mix in desired liquid 1/2 cup at a time until potatoes reach desired consistency. Salt and pepper to taste.